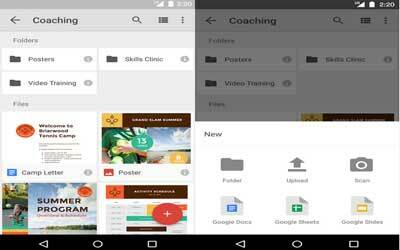 Google Drive APK new 2.4.211.35.30 is a file storage service formed by Google. In addition, you are able to synchronize your files using this web service. By having Google Drive, you have the ability to store your files in the cloud, edit documents, share files, and many other things. It was released on April 24, 2012. Until October 2014, this web storage has 240 million active users. Google Inc predicts that the amount of users will booming rapidly since everything is being portable now. To do synchronization files, your android must be linked to Google Driver software. This service is available for personal computer, android smartphone, tablets, iPhone, and iPads. For android users, you must at least use Android 2.1 operating system or higher. How does Google Drive work? This software gives 15 GB of online storage for each user. You can store and synchronize your files for more than 15 GB by paying it monthly. There many features you can get from this software, including file storage, sharing, file viewing, searching, editing, and many more. You can share your files, so other users will have visibility to see the other files. You are also able to share your files to others using Google account. File viewing feature allows you to see these following types of file, such as image files, video, audio formats, test files, Microsoft Office, Adobe Illustrator, PostScript, and many more. Moreover, searching feature gives the ability to look for much kind of needed files. The files are sorted by file types and visibility. Editing feature gives you right to edit your own file directly from your android device. In doing presentation for business or education, this software plays important role as flash disk, so it is okay if you forgot to bring your flash disk. Try to use Google Drive for Android and enjoy the easiness of life. See file details and activity. Enable viewing of files offline. Access pictures and videos from Google Photos.